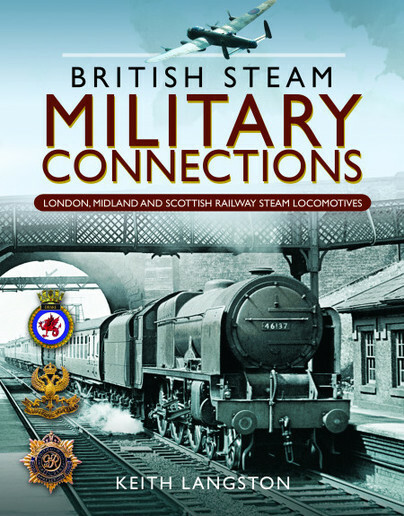 You'll be £24.00 closer to your next £10.00 credit when you purchase British Steam Military Connections. What's this? In Great Britain there existed a practice of naming steam railway locomotives. The names chosen covered many and varied subjects, however a large number of those represented direct links with military personnel, regiments, squadrons, naval vessels, aircraft, battles and associated historic events. Memorably the Southern Railway (SR) created a Battle of Britain class of Light Pacific locomotives, which were named in recognition of Battle of Britain squadrons, airfields, aircraft and personnel. The Great Western Railway (GWR) re-named some of its express passenger Castle Class engines after Second World War aircraft. Names were displayed in varying styles on both sides of the locomotives, additionally some nameplates were adorned with ornate crests and badges. Long after the demise of mainline steam, rescued nameplates are still much sort after collectors' items, which when offered for sale command high prices. This generously illustrated publication highlights the relevant steam locomotives at work and explains the origins of the military names. Cheshire based Keith Langston is a widely published and highly respected photo journalist specialising in railway and other transport related subjects. His interest and vast knowledge of all things railway stem from being brought up in the North West of England as part of a railway family. Over the past 25 years he has operated as a contributor to heritage sector journals whilst establishing himself as an accomplished author in his own right.